KANSAS CITY, Mo. - Alex Gordon took a big rip at a batting-practice fastball, fouled it off badly into the cage, and ducked when the carom nearly hit him in the head. Gordon let out a huge laugh, and so did a bunch of his Kansas City Royals teammates watching Monday's workout. "I can't believe that just happened, dude," pitcher James Shields razzed. It'll be more frustrating than funny if those are the same awkward swings the Royals and San Francisco Giants take once the World Series begins. Going into Game 1 on Tuesday night at Kauffman Stadium, both teams will deal with a familiar issue this deep in the post-season: Does an extended layoff translate into rest or rust? Buster Posey and the Giants zipped through the playoffs, and now will try for their third title in five years. Lorenzo Cain and the Royals zoomed along, reaching the Series for the first time since 1985. And then, they all got some time off. Almost an eternity, by October standards. The Royals went 8-0 in the AL playoffs, giving them five idle days before Shields starts the opener. San Francisco went 8-2 on the NL side and had four days to relax before Madison Bumgarner pitches. "It's definitely different because we have played so many games over the last 7 1/2, eight months. But you just understand it's one of those things," Posey said. As recent history has shown, hitters can be very vulnerable when they get out of rhythm. "It affects a bit with your timing, especially when trying to adjust to pitchers," Kansas City second baseman Omar Infante said. "It's hard to recover that groove you have." The slightly favoured Giants and Royals held practices, studied video and checked out scouting reports. But as several teams that stumbled in the World Series after long breaks discovered, nothing can duplicate playing a real game. Triple Crown winner Miguel Cabrera and Detroit got nearly a week off in 2012, then the Tigers hit a combined .159 and totalled six runs in getting swept by the Giants. Troy Tulowitzki and the Colorado Rockies rushed into the 2007 World Series, waited a week and got outscored 29-10 in Boston's sweep. A year earlier, Magglio Ordonez and the Tigers looked so powerful in the playoffs, but fell apart a week later and hit only .199 in a five-game loss to St. Louis. Infante played on both of those Detroit teams that got wiped out. He actually excelled in 2012, hitting .333. "It's a short series, you need some luck. We lost four in a row and they were coming from playing seven. In this series, I think both teams are even," he said. Royals reserve Raul Ibanez, who's enjoyed post-season success in the past, said "determination and will" carry players in the fall. Yet the timing and confidence that lifts them for so long can be lost in a hurry. All of a sudden, a ball that might've been a solid double becomes a soft fly. A line drive up the middle turns into a foul ball straight back. A big hit winds up a great catch. Just like that, a magical touch is missing, and can't be recaptured until it's too late. Royals catcher Salvador Perez hooted at himself after a popup and an easy grounder in BP on Monday, and changed bats for his next round. He homered on his final swing. "When you've been playing for seven or eight months, it's nice to have an off day every now and then. But when you do have those workout days where you just go in and hit BP and take grounders and stuff, you try to keep it as much like game day as possible," Giants first baseman Brandon Belt said. Royals designated hitter Billy Butler said he didn't see the five-day break being a detriment. "Hey, they've had four days off. That's the way you look at it. They played one day later than we have — they've had a layoff, too," he said. "I don't know if it'll play any factor. It definitely won't be the reason if we go out there and don't win tomorrow," Butler said. Shields and Bumgarner seemed unconcerned. This will be Shields' first start since Oct. 10 in the AL Championship Series opener against Baltimore. "I think this late in the year almost too much throwing is too much," he said. "So I've just kind of rested my body up for tomorrow." Bumgarner has already thrown 249 innings this year, including four post-season outings. He was the NLCS MVP, and started last Thursday when the Giants closed out St. Louis. "Honestly, I feel the best I've felt all year for the last probably two months," the lefty said. • The Royals hit .444 with runners in scoring position in their 3 games against the Giants - 12 hits in 27 at-bats, including 14 RBI. The Giants, in contrast, hit more than 150 points lower, with 0 HR. • The Giants starting rotation struck out just 8 batters in 73 batters faced, good for 11%; for context, the lowest rotation strikeout rate overall this season was the Rockies at 16%. • The Royals bullpen did what it's been doing in the postseason - shutting batters down. The KC bullpen logged 6 and a third innings, allowing 0 runs while inducing 9 strikeouts to 1 walk. 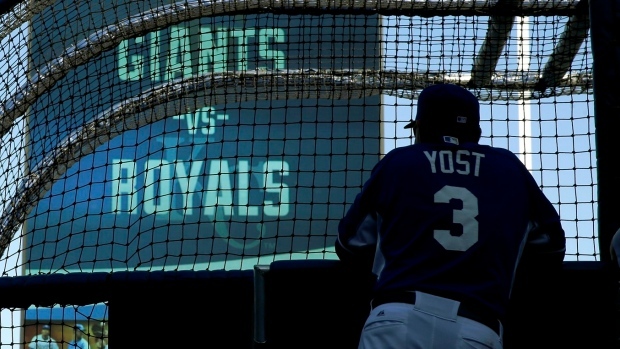 * The Royals (8-0) and Giants (8-2) are a combined 16-2 this postseason. FROM ELIAS: That's the best combined record in the Wild Card Era entering the World Series and 4th-best in the Divisional Era (both teams swept best-of-5 League Championship Series in 1969, 1970 and 1975). * The Royals (89-73 in regular season) or the Giants (88-74) will join a small group of teams with fewer than 90 wins in the regular season to capture the World Series since BOTH the American and National Leagues first played a 162-game schedule in 1962 (the AL did so in 1961, the NL in 1962). * Five Wild Card teams have won the World Series and 3 of those Fall Classics went the full 7 games. * This is the 1st World Series between winners of the Wild Card Game and the 2nd World Series between 2 Wild Card teams (in 2002, the Angels defeated the Giants in 7 games). * The Giants have won 2 of the past 4 World Series titles. Only 4 different franchises in baseball history have won 3 World Series in 5 seasons, including the Athletics, who did it in 2 different cities. * Bruce Bochy is looking to become the 10th manager in major-league history to win 3 World Series titles. The 9 managers who have won 3 are all in the Hall of Fame. * Bochy is one of 12 men to manage 20 seasons, compile a winning record, and win multiple World Series. Ten of the other 11 are in the Hall of Fame. * Madison Bumgarner has gone at least 7 innings allowing 3 runs or fewer in 5 straight postseason starts. * Buster Posey trails only Barry Bonds on the Giants' all-time postseason RBI list. Pablo Sandoval is tied for 5th. * Sandoval has reached base in 23 straight postseason games, the longest streak in team history. * The Royals have won 8 straight games to start this postseason, the most in major-league history. 2014 Royals 8 << ? * The Royals haven't lost a playoff game since Game 4 of the 1985 World Series. So there's a 29-year gap, but they now have the third-longest win streak in baseball postseason history, trailing only the Yankees team that won titles in 1998 and 1999, and the Yankees club featuring Babe Ruth and Lou Gehrig that swept three World Series between 1927 and 1932. * The Royals are just the 5th team to sweep the ALCS since moving to the best-of-7 format in 1985, and the first since the 2012 Detroit Tigers. Kansas City will look to break the trend though, and become the first team in this span to win the World Series after sweeping the ALCS. * The Royals are the 3rd Wild Card team to sweep their LCS en route to the World Series. The 2 previous teams to do so lost in the World Series. * Ned Yost has won all 8 of his postseason games as a manager, the longest streak to begin a managerial career in postseason history. * His 8 wins in this postseason are already tied for the most postseason wins by a manager in franchise history. * According to the Westgate Las Vegas Superbook, before the start of the regular season, Kansas City was 15-to-1 to win the pennant, tied with the Indians for 8th in the AL, and 30-to-1 to win the Pro Baseball Championship. * The Royals have as many playoff wins in this postseason as the Chiefs do in their entire franchise history. * Lorenzo Cain won ALCS MVP, hitting .533 with 2 extra-base hits in the series. The Royals offense has seen a big improvement since Ned Yost moved Cain to the 3-hole and Alcides Escobar to the leadoff spot on September 13th. * They also kept up their small-ball success, scoring both runs on a fielder's choice and an error. They are trying to become the 6th team in history to finish last in baseball in HR and win the World Series, and the 1st American League team since the 1924 Senators. * The Royals snapped the 7th-longest streak without a World Series appearance, and extended the 6th-longest for the Orioles in the process. ** Below is a visual representation - it shows where outfielders make catches on at least half of the balls hit with a 3-4 second hang time (most fly balls). The blue zones show the ground the Royals outfield covers. The orange zones show the ground covered by average MLB player at that position. 8 - There have been 8 home runs hit by 5 different rookies in this postseason... Both of those are 2nd-most in a single postseason... Kolten Wong had 3 of them. * The Royals aren't the only team getting excellent pitching from the bullpen. * The Royals rode their excellent late-inning relievers all the way to the World Series. Their three relief studs have been almost untouchable in the postseason. ** If you're wondering how the Giants might fair against high velocities from the Kansas City bullpen, it's worth noting just how well a few Giants hit pitches of 95+ from right-handed pitchers this season (as Holland, Davis and Herrera all are).